When I saw that one of my rugby girls Megan, (go follow her!) was hosting a bake sale in aid of Young Minds I simply couldn’t resist the urge to crack out the baking trays again! 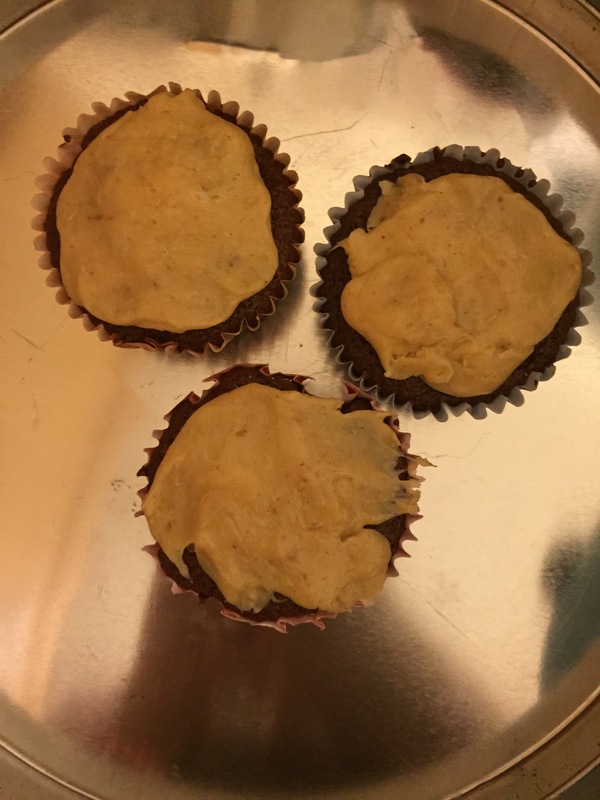 The recipe I am going to share with you today came to me in a moment of indulgence in the office one day and I just HAD to try them out! 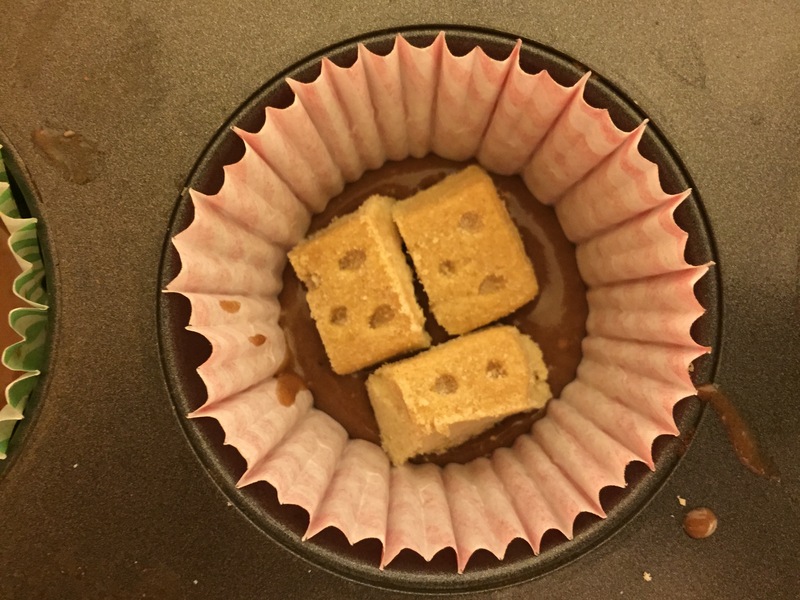 Basically, I was munching on a Waitrose millionaire shortbread bite (honestly…they are AMAZING) and I wanted to make a salted caramel version. BUT…I was sitting in a meeting, thinking about what an effort it is to temper chocolate, get caramel to the perfect consistency etc etc so I put that one on hold. 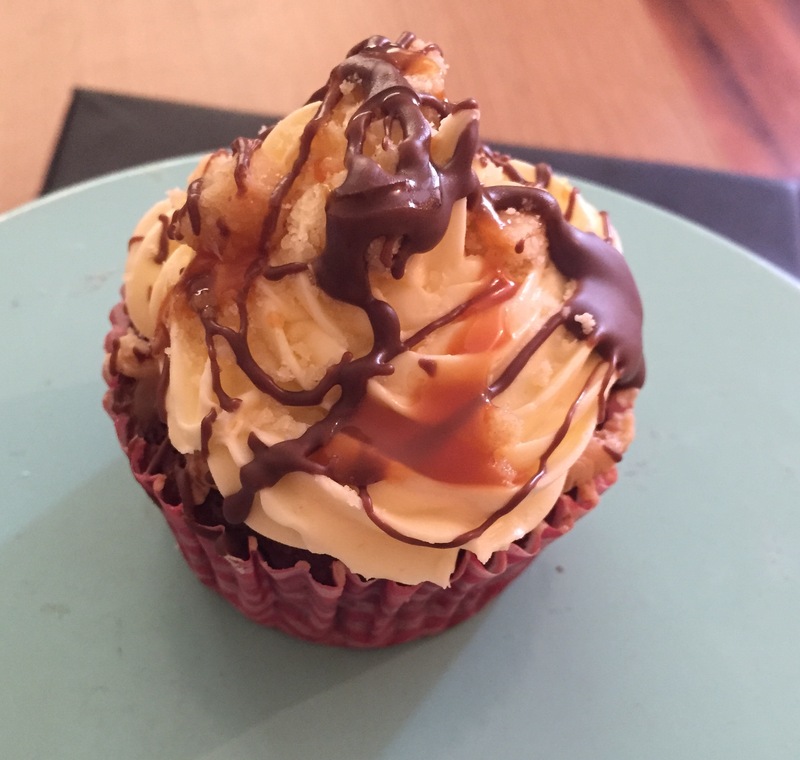 I still wanted to use the idea for Megan’s bake sale though….so I came up with a design for a salted caramel millionaire CUPCAKE!! Yep…everything you could possibly want from a millionaire slice but in cupcake form! I have made this up from scratch so if it is similar to any other recipe out there I am sorry but I didn’t know so can’t credit!! Jaclyn is American…she uses cups, I have changed it to grams for this one! Kosher salt or rock salt…Honestly, it REALLY doesn’t matter!! I bought it because I simply didn’t have the will to make it!!! I would recommend ROUND shortbread but you can use any! Ok, I know that is a HUGE ingredients list but I promise you that it is TOTALLY worth it. Pop the flour, sugar, cocoa powder, baking powder, salt and butter (which should be room temp) in a mixer OR use a hand held electric mixer. Blend until it has a sandy texture and everything is combined. Next, add HALF of the milk GRADUALLY and beat until just incorporated. Whisk the egg, vanilla and remaining milk in a jug. Pour this into the flour mixture and continue to mix until just incorporated. Use a spatular to scrape any unmixed ingredients from the side of the bowl. Continue mixing for a few minutes until the mixture is smooth. DO NOT OVER MIX. Now you have a cake batter, you need to build the cupcake! Pop a spoonful of the mixture in the bottom of each cake case. Add cake mix on top until the cases are approx. 2/3 full. Bake for 20-25 minutes or until springy to touch, leave to cool on a wire rack when they are baked! While the cakes are cooking it is time to make the salted caramel. It is REALLY simple if you follow the instructions. Gather all of your ingredients and have them nearby ready to add to the mixture as needed. In a large heavy-bottomed saucepan, heat the sugar and water over a medium/high heat whisking constantly to dissolve the sugar. Once the mixture is boiling, stop whisking and allow it to boil until it reaches a dark amber colour, carefully swirling pan occasionally. Seriously…be careful, its blooming hot!!! Once mixture reaches a dark amber colour, immediately add the butter and whisk until it is melted then immediately remove from heat. Wait 3 seconds (yep, a really precise amount of time!) then carefully pour in cream and immediately whisk to combine (it will bubble like mad). Add salt as you mix to your desired taste. The mix will turn a pale gold colour. Remove from heat and continue to stir a little to make sure it doesn’t burn on the still hot pan. Allow to fully cool…it will harden quite a bit in this time and go quite chewy. Bored yet?! I hope not. I PROMISE its worth it! Seriously, just take another look at them…. Its totally time to assemble the cake now!! I don’t know about you but I actually LOVE this bit. It is fiddly and can be time consuming but its so cool to see the finished product coming together!! 1st step… cut a hole in the middle of each cake….you know, like you are making a fairy cake…make it quite deep and not as big a circumference as you would for a fairy cake. Don’t worry about replacing the top to cover the hole…the chewy caramel will do this for you! 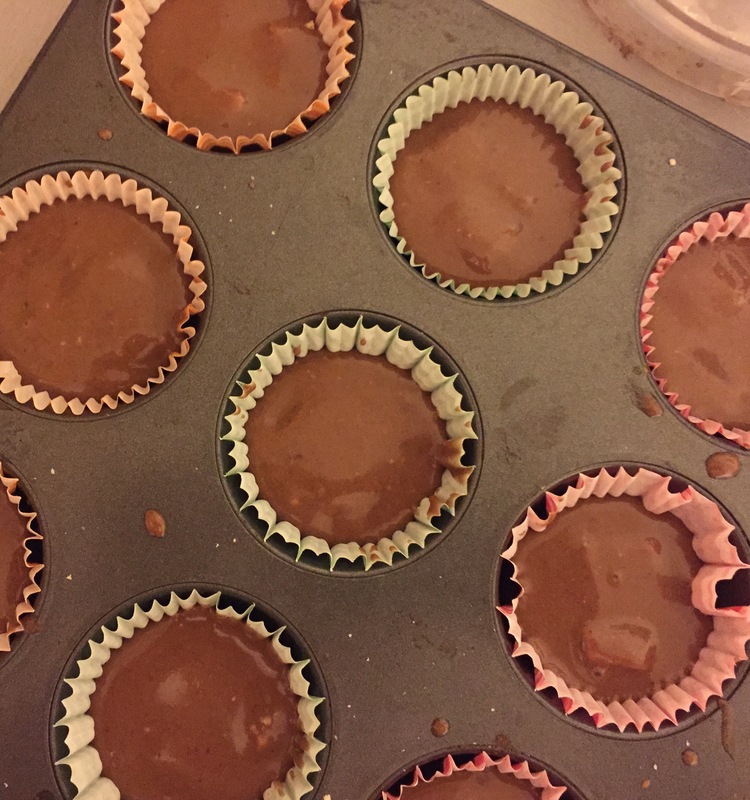 For the chewy caramel you will need to get your hands involved… it is the easiest way! Take a bit of what should be by now, pretty mouldable caramel, and press it into shape on top of the cake…honestly, this is so hard to describe….just look at the picture! 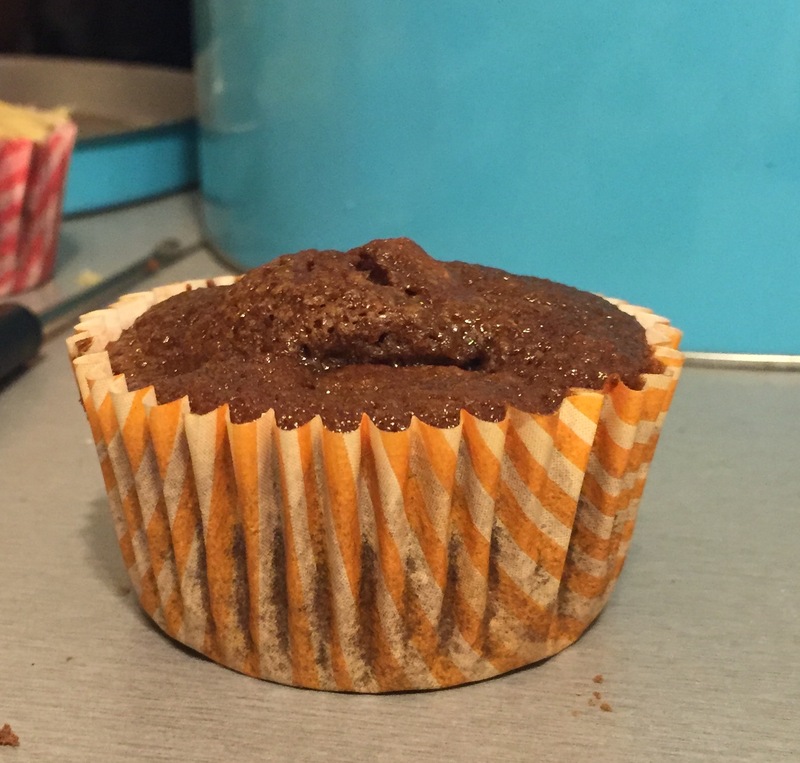 Remember, this will be covered with frosting so don’t worry about it being perfect! You COULD use a fork, spoon or even pallet knife if your caramel isn’t as toffee like as mine was! Ok, we are almost done. Just the decoration to do! I would recommend a mixer with a LID for this bit! Turn the speed of the mixer down (if you can) and gradually add the milk & vanilla. The longer the frosting is beaten, the fluffier it becomes! OK, now you have your frosting, you need to top the cake with it! I piped it with a star tip but you can spoon it on and smooth with a pallet knife if you so wish. Once your cake has frosting it is literally just decoration you need to do now! Sprinkle some shortbread crumbs on top. 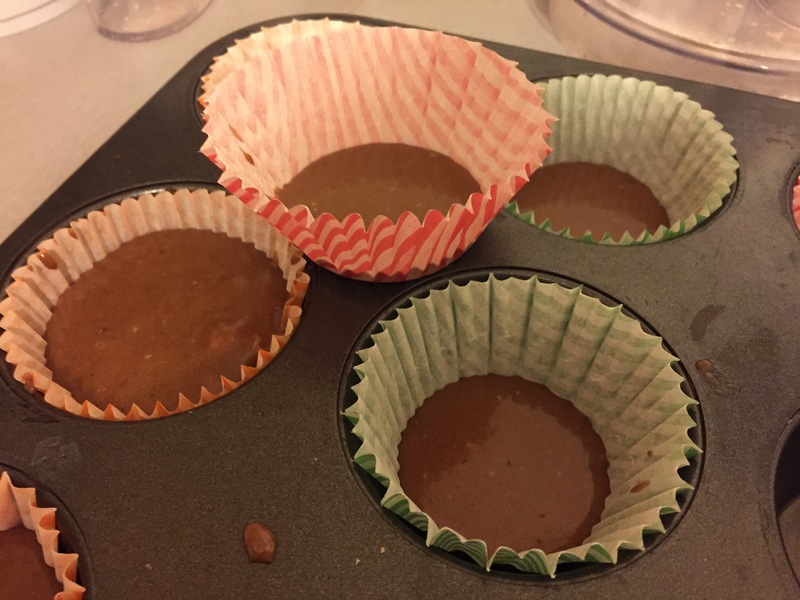 Melt the chocolate in whichever way you prefer…I picked microwave for this time round…its quick & there is barely any chocolate to melt! Once it is melted simply drizzle it over the cake. Add a bit of caramel sauce it you want…it adds a bit of extra colour to the cake and I personally think…you can never have enough caramel!! There you have it…the time it takes is so totally worth it! Enjoy with a cup of tea. You won’t regret it!